What does air pollution have to do with climate breakdown, and what does any of this have to do with veganism? Aerosols are particles suspended in the atmosphere. 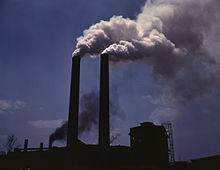 Burning fossil fuels puts such aerosols (more prosaically known as “air pollution”) into the atmosphere. But aerosols, instead of promoting global warming, promote global cooling, by blocking the sun’s rays from reaching the earth. Thus, air pollution partially offsets the effects we would otherwise see from emissions of carbon dioxide (CO2). This is analogous to the cooling effect that volcanic eruptions have on the climate. In 1991, there was a cataclysmic eruption of Mount Pinatubo in the Philippines that threw 20 million tons of sulfur dioxide into the air. This resulted in a temporary cooling of the global climate by about 0.5 degrees C.
Air pollution doesn’t in itself cause a problem for the climate. In fact, perversely, it seems to counteract climate change. The problem comes when we stop putting aerosols into the atmosphere. The “cooling” aerosols will drop out of the atmosphere within about a year. But the “warming” CO2 will hang around for up to a century. If all we do is completely stop all burning of fossil fuels, the climate will actually get warmer and stay warmer for another century or so until the atmospheric CO2 levels begin to fall. How much warmer would we get? 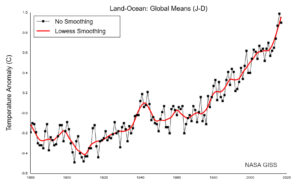 The authors’ conclusion in this recent scientific article was that temperature increases could be a lot more than previously thought — about 0.7 degrees C, within a range of 0.5 to 1.1 degrees C. That’s roughly the same warming, in one year, as the total net warming since 1944. Even with air pollution “helping,” climate change is already bad enough. Imagine the sense of betrayal that people will feel after finally getting rid of fossil fuels when this actually makes things substantially worse. Moreover, such an unexpected increase might propel us across other tipping points in the climate. Such feedbacks might lead to a runaway greenhouse effect and mass extinctions. So what does this have to do with veganism? If we are close to dangerous climate tipping points (and I believe we are), we need something quick to bring us back from the brink of climate disaster. Getting rid of livestock agriculture could do the trick. Getting rid of fossil fuels without getting rid of livestock might actually push us over the edge. Climate breakdown is caused not only by burning fossil fuels but also by our land use which has massively disrupted the biosphere. Livestock agriculture is a key source of methane, which has a dramatically greater effect on climate (per unit volume) than does CO2. Moreover, methane has a much shorter half-life in the atmosphere than does CO2; it will start to break down within a decade. If we eliminated livestock agriculture — which we need to do anyway, for numerous other environmental, health, and ethical reasons — this would have a rapid effect on methane levels. Within 20 years we could see a noticeable alleviation of climate change. Livestock agriculture devastates plant life, thus indirectly leading to a rise in CO2 levels, as discussed both by William Ruddiman in Plows, Plagues, and Petroleum, and by the Goodland and Anhang article “Livestock and Climate Change.” But since cattle don’t contribute significantly to air pollution in the first place, reducing or removing livestock would not have the confounding effect of removing any “cooling” aerosols. Moreover, by allowing forests to take over land previously devoted to livestock, we could actually reduce CO2 levels. The costs of going vegan are quite minimal compared with (say) the costs of replacing fossil fuels with solar and wind power. We could easily spend billions or trillions of dollars on renewable energy and still not fully replace fossil fuels. Even if we succeeded, it could make climate problems worse for perhaps a century. Eliminating livestock agriculture, on the other hand, would have immediate climate benefits and would be quite inexpensive — indeed, it would have benefits rather than costs for most humans. Don’t get me wrong: we still need to eliminate fossil fuels. Even universal veganism is not enough. But getting rid of fossil fuels isn’t enough, either. Air pollution has been masking the true extent of our climate disaster. We need a multi-pronged approach which will reshape our economy and indeed, reshape our entire culture. There is a new book out now called Eat For The Planet that belongs in our schools and libraries with its simple explanations and colorful infographics. Mainstream science does not want to tell people that part of the solution is dietary. Now the country is distracted by daily new mini-scandals coming out of the White House, and the Left is so sidetracked by the Resistance that climate change has fallen off the radar despite the shrill screams of climate scientists. Eat for the Planet will be the topic of a future blog — still waiting for our copy to arrive so I can review it. Looks like a great concept!